16 Jun 2016 --- The World Health Organization’s cancer research agency says beverages consumed at more than 65C are probably linked to esophageal cancer. Coffee was classified as a possible cause of cancer in 1991, but the International Agency for Research on Cancer (IARC), which is part of WHO, has now reconsidered the evidence. It carried out a detailed review of the many studies published on the subject and found that coffee drinkers have no reason to worry. IARC also investigated the herbal drink mate, also known as chimarrão or cimarrón, which is widely consumed in South America, where esophageal cancer is more common than in other parts of the world. The experts found that mate was not a cause of cancer, but they believe the temperature at which it is drunk probably is – and that other very hot drinks could also be linked to esophageal cancer. Mate is drunk at temperatures of more than 65C (149F), often through a metal straw. The scientists also looked at drinks including tea consumed at high temperatures in central Asia, China and Japan. 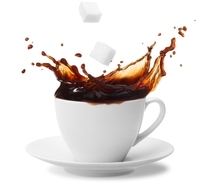 “There is limited evidence in human studies, and limited evidence in animal studies, for the carcinogenicity of very hot drinks,” said Loomis. IARC produces what it calls monographs on the causes of cancer, which use classifications from group one, where the link is definite, as with smoking; to group four, where there is probably no link. The new monograph classifies hot drinks as group 2A, meaning they are “probably carcinogenic to humans”. Coffee and mate served cold are in group three, which means there is insufficient evidence to believe they cause cancer. IARC’s conclusions are published in the Lancet Oncology journal. In European countries, coffee and tea are usually drunk at below 60C, he said, and milk is often added, which cools it. Tea in Iran and mate in South America are often drunk at 70C. “Mate is not only prepared very hot, but drunk through a metal straw that delivers it directly into the throat,” he said. Studies in animals have shown that very hot water can promote the growth of tumors. “It appears that there is thermal injury from exposure to hot liquids that is capable of leading to cancer of the esophagus,” he said. IARC’s classifications relate to the strength of the evidence for a causal association, rather than the frequency with which something causes cancer. This is why tobacco, which increases the risk of cancer 100-fold, is in the same group as UV rays from sunbeds, which increase the risk of skin cancer two-fold. The scientists found an inverse relationship between drinking coffee and certain types of cancer. The risk of developing liver cancer dropped by 15% for each cup of coffee drunk, while in breast cancer and endometrial – or womb – cancer studies suggest there were fewer incidences among people who drank coffee than those who did not. However, other factors could be responsible, and IARC does not consider that drinking coffee protects people from cancer.